Light freeze: 29 degrees F to 32 degrees F — tender plants killed, with little destructive effect on other vegetation. Moderate freeze: 25 degrees F to 28 degrees F — widely destructive effect on most vegetation, with heavy damage to fruit blossoms and tender and semi-hardy plants. Severe freeze: 24 degrees F and colder — damage to most plants. 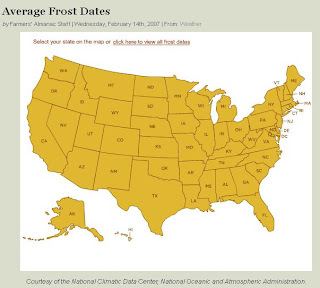 Click the link below to go to the click-able map to chick the last Spring Freeze/Frost dates in your area. Happy planting!